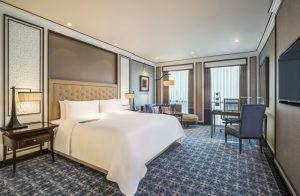 Located centrally on Wireless Road just 5 minutes away from BTS Skytrain, Plaza Athénée Bangkok, A Royal Méridien Hotel is fully equipped with superb facilities including 24-hour fitness, outdoor swimming pool and jogging track in the tropical garden. The hotel is also one of Bangkok’s most gastronomically vibrant hotels offers the opportunity to explore lavish buffets, classic + creative Cantonese, Japanese, Thai and Modern French restaurants. Not to mention the sophisticated lobby bar and chic patisserie.